I've never grown a Amaryillis before so was really excited when the bulb arrived and a few weeks later it started producing leaves. It now has four beautiful leaves! wheres the flower? Am I just being impatient? Theres just no sign of a emerging flower bud whatsoever. Unless it was a special one, like 'Papilio', it should have produced the flower first and then, when the flowers had gone over, the leaves. do you know what its name is? No, you are not being impatient, by the way. I'm pretty sure that it is a 'Papilio', does that mean it may still flower then? I have one of these, and we have to be patient, Reem. I planted mine before Christmas last year and it did what yours has. I was advised (on here!) 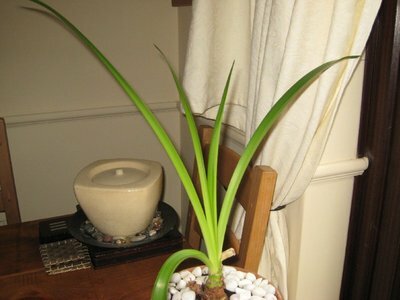 to feed it and keep it watered to build up the bulb to flowering size. So it is different in that it doesn't go dormant like other Amaryllis. Now it has more leaves, but no sign of flowers as yet. SIGH! I grew other Amaryllis last year for the flowers, and I've bought two more for this year - not Papilio though! I refuse to be beaten, so it will stay on my windowsill until it DOES get flowers on it - however long it takes! Thanks for the reply, bit disappointing, was hoping it would flower for xmas. Never mind, will do as you say and keep it fed and watered and see what happens. Think i'll go get some different Amaryllis bulbs!! I've had amarilles lilies in my garden and last year no flowers, this year one did flower nicely with two flowers. The others are still just like yours. Yes... they sometimes play difficult to get (to bloom) LOL! I once bought one bulb of a double flowering species. It was A. Blossom Peacock. I planted it , put it on a warm, well lit spot and gave water regularly. The months, yes MONTHS, went by and still not a sign of leaves or flowers at all! I began to think the bulb was not alive and wanted to complain to the seller. One day i took the container in order to throw away the bulb. I looked (lucklily for me and for the plant) one last time at the bulb and.... yes! there was a tiny little peak emerging from the base i immediatly recognized as a bud. As the spike grew, i saw the bulb was busy producing offset. Plants have their cicles of live. Maybe my bulb was using all its energy to reproduce itself rather than to bloom. Forcing amaryllis to go dormant helps progamming their blossom time. If they don't go dormant they will flower in a very random way. Blossom time will not be predictable. I have tried both ways. If they keep refusing to bloom it could be because of one of the following rasons: they don't get enough light, the temperature is too low (they prefer 20 degrees and above) or the bulb still has not reached its flowering size. Or maybe, just maybe it is not the time yet. Thanks for that Holantina, it still hasn't flowered but has some impressive leaves!! Am going to be patient with it and just let it do its thing, am watering it when dry and feeding it every few weeks. Will update if any change!